At 11:15 am, some hoodlums stormed the Senate chamber and made away with the mace. 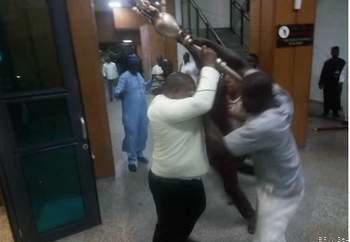 The plenary had been disrupted while the sergeants-at-arms are battling with the men to retrieve the mace. Deputy President of the Senate, Ike Ekweremadu, who presided, said the invaders would be punished while calling on senators to settle down for a continuation of the proceeding.